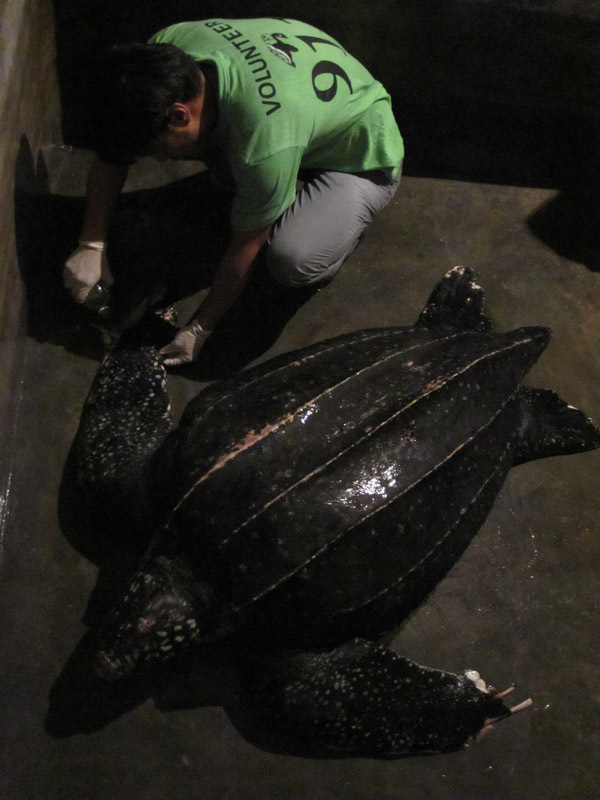 Chinese fishermen have reported the death of a Leatherback sea turtle (Dermochelys coriacea) on Hainan Island, China. The turtle was caught as by-catch by a fishing vessel on November 24 and held in a concrete saltwater pool. Leatherback turtles are adapted to the open ocean, so they swim continuously against tank walls since these pelagic turtles do not recognize physical barriers. Contact with the rough surface caused tissue abrasions, bone exposure, and infection on the Leatherback’s nose, flippers, and ridges along the back of its shell. Sea Turtles 911 Founding Director Frederick Yeh describes, "She was very weak, very far gone. Despite the emergency treatments we performed, there was little we could do at that point to save her. Leatherbacks are particularly vulnerable to injury in captivity, and the fisherman contacted us much too late. The waste of such a precious life is heartbreaking." It is unknown how many Leatherback sea turtles are bought and sold illegally in China, or what they do in the surrounding waters, but the frequency of local fishermen reporting ‘tire turtle’ sightings suggests possible migration routes past the island. Yeh is determined to find out for certain, "This beautiful, rare sea turtle’s death cannot be in vain. We need more resources to help us find out what the Leatherbacks are doing here, and how many are being taken by local fishermen. Only then will we be properly equipped to protect them."